LONDON--(BUSINESS WIRE)--Rapid and accurate diagnosis of illnesses is extremely important to the health both of an individual and of the general population. A quick diagnosis allows for fast treatment and reduces the risk of others being exposed to an infectious disease. However, for many illnesses, timely analysis is still a significant challenge, with the process sometimes taking days to complete. Researchers are therefore constantly looking for ways to improve it. Infiniti Research recently performed an assessment of the infectious disease diagnostic testing market in Europe for a leading player in the global market. The primary objective was to analyze the market trends, growth drivers, and challenges for the market in the target region. The study also offers a detailed overview of targeted market segments including rapid diagnostics (POC), molecular diagnostics, immunoassay, and microbiology. Several firms are currently collaborating to develop a fast, low-cost sensor for diagnosing hepatitis. The sensor uses graphene and can test simultaneously for hepatitis A, B, and C. Hepatitis is a global problem, affecting almost 400 million people. China is one of the countries most severely affected by the disease, and this new project aims to help combat it in the region. The sensor is being developed by the National Physical Laboratory (NPL), the University of Chongqing, Swansea University, and CTN, with support from the U.K.'s Newton Fund. The collaboration between the UK and China will significantly improve the way hepatitis is diagnosed in China, as the new test is non-invasive, fast, and less expensive than blood tests. The current two-year project is for the development of a prototype and preparation for commercialization. The healthcare landscape is constantly changing and evolving, as scientists and medical experts look for new ways to deal with health threats. New technology emerges, along with new opportunities in multiple regions. Market intelligence can help identify new opportunities and threats, and evaluate the attractiveness and risk level of different markets. 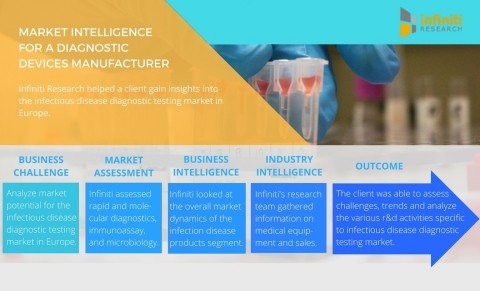 Infiniti’s recent assessment of the infectious disease testing market provided a detailed overview of the market segments and helped the client understand the overall market dynamics of the infectious disease diagnostic products segment. Infiniti’s researchers provided actionable insights on the design and manufacturing requirements for the diagnostic testing market and shed light on the performance and warrant standards of diagnostic testing devices. Established in 2003, Infiniti Research is a leading market intelligence company providing smart solutions to address your business challenges. Infiniti Research studies markets in more than 100 countries to help analyze competitive activity, see beyond market disruptions, and develop intelligent business strategies. With 13 years of experience and offices across three continents, Infiniti Research has been instrumental in providing a complete range of competitive intelligence, strategy, and research services for over 550 companies across the globe. Infiniti Research releases market assessment for infectious disease diagnostic testing in Europe.